Since I spoke about running contacts in my 2012 wrap-up post, I thought I would take some time to share what we did in more detail. I had been toying with teaching a modified four on the floor before our training was interrupted in 2009. What I had been trying to work towards was a down on the end of all contacts with the front feet off the contact and the rear feet on. Since our return last year, I decided that, given Bear’s age and my concern over his structure, I would try to teach a running contact. The worst thing that could happen was that we would d be stuck with the contact performances which was non-existent. If you can be certain of anything, it’s that if a particular technique is useful in competition, has merits, 5 different top level competitors will come out with 5 different methods for training it – and most of them will put this into a DVD, book or seminar. Placing feet in the contact zone on the way down. Once I decided this was something I wanted to do, I did some Googling of “running contacts” among the results was a free explanation with videos and answers to questions from Silvia Trkman. I will not get into the nitty gritty of the method, you can see it for yourself on her website. The basics of this method are teaching your dog, from the beginning that the two things that are rewarded on the a frame re 1. )speed and 2.) placing feet in the contact zone. Bear and I went to a friends house to practice. I used a clicker to mark speed and foot placement and used a tennis ball thrown ahead as reward. It was if the light bulb really turned on for him and in about 3 sessions I had him racing over and coming all the way down. In 4 sessions, I was able to add a bit of distance and I now had a relatively consistent behavior to reward consistently in class. As far as I can tell there is only one main advantage for most teams when training this method and it is speed. In super high level competition, a 10th of a second can mean the difference between 1st and 4th place. Speed is rarely an issue for us because we always finish with time to spare unless we have to redo weaves – another story for another day. I don’t need to slow Bear down – he prefers to go and this allows me to reward him for good performance by letting him go! I think it is a more comfortable way for him to perform the exercise (my thoughts on this are below). The following pitfalls. criticisms and challenges come from both the internet and my own experience. Not being able to front cross on the a frame descent unless you can manage a significant lead out (my experience). This means you need to explore other ways to handle changes in direction after the A frame. The two that come to mind are the rear cross on the ascent of the A frame or a verbal cue (in/out, left/right) to tell the dog where to go before he clears the a frame. Criteria is murky (internet chatter) – The fundamental difference between training 2o2o and running contact for me is the ability to move from marking a fixed position (nose on target) to marking a movement within a particular space (feet in the qualifying contact zone). I think that this makes criteria murky for the human. If you are marking behavior properly (clicker/sound/voice) your dog knows exactly what you want. The running contact requires your dog to learn how to adjust his stride so he can ascend and descend properly – then he needs to use this pattern every time. I knew Bear had this figured out his stride when he could consistently place his front feet t 1/2 way down the contact zone. It takes too long to teach (internet): This took us 4 sessions, over bout 3 days, I think. The thing that became clear to me in the process is that the dog and handler team that have used shaping to teach various behaviors are at an advantage because they have a clear and consistent form of communication. These kinds of teams also tend not to focus on ‘wrong’ performances which I think is easier on the dog. Judges can’t “see” a qualifying performance if your dog moves too fast (internet chatter): As a judge (of a much slower sport, mind you) I find these kind of comments insulting. The few trials I have attended around here, I notice that judges always position themselves well to see contact performances. A contact performance that is borderline is always going to leave judges wondering, regardless of how the dog was trained. In my opinion, if you train your dog to land well within the zone on his way down you’ll have no issues. If, however, your criteria is ‘run down the a frame, placing one toenail on the top of the contact and launching directly to the ground’ then yes, I can see a judge calling it as a missed contact. Why I think it worked for us. I think there are a few reasons why this performance worked for us and I think that if your circumstances are different then it might not be the best choice for you. Equipment: We had access to an real a frame to train on outside of class. Bear’s size: Slowing down enough to stop quickly is difficult for a 90lb dog, especially a dog that does not have a natural tendency to ‘creep’ like border collies. There are large dogs that can do this but I don’t think all dogs can do it comfortably. Bear’s structure: Having spent some time at a few structure seminars and doing some online research, I have learned that Bear has rather straight shoulders. According to Chris Zink, upright shoulders affect a dog’s ability to absorb the dog’s weight as his feet hit the ground. This means that a dog h straight shoulders has to compensate with muscle which may or may not be able to support this kind of pressure. Our communication style: We a lot have experience training all sorts of behaviors with the clicker. Bear is able to both offer behaviors and offer something different if the behavior he offers does not pay out. This means I can change criteria fairly easily. It also means I can mark and reward tiny incremental behaviors. Now that we are officially into the year 2013, I have been thinking about what a huge adventure the year 2012 was for Bear and I. We tried some new things, we succeeded at some things, we failed at others. I smiled a lot, I laughed a lot, I cried a little. Below are some of the great adventures we had this year. 1. Bear became a senior: Bear turned 8 (ish) at the end of December so 2012 was his first year as a senior. Aside from some lymph node swelling (NOT Cancer thank god, just a viral infection, we figure) he has been happy, healthy and fit as a fiddle. That doesn’t stop me from worrying about every little thing or dishing out all the prophylactic supplements that I can. 2. We met sheep: Meeting sheep was fantastic – the fact that Bear did not kill a sheep was even more so! Bear’s Herding Instinct Test was probably one of the best ‘dog’ experiences of the year. 3. 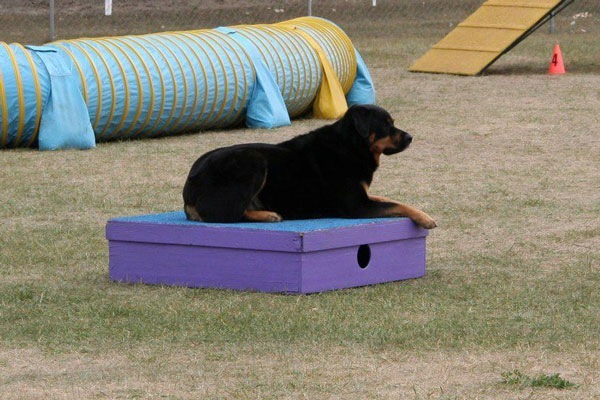 We went back to Agility: Finally, business at the daycare is steady enough and I have enough of a routine that I could make time to go back to agility. We are behind many dogs Bear’s age but we are still having a great time. Think he’s having fun? I do! 4. We entered our first Tracking Dog test: This was not a great time in the conventional sense but I stuck my neck out there, it was a learning experience and I’ll be damned if we go back and fail (as miserably) next year. 5. Bear recovered from an iliopsoas injury: Not sure what started it but we managed to recover nicely with the help of a great vet, a great canine rehab therapist and a great canine massage therapist. 6. I attended my first online training class: The challenge of teaching classes and owning a dog daycare is finding time to train and someone to train under. The online Scent Work class gave us a great opportunity to work on our own at something completely new! 7. 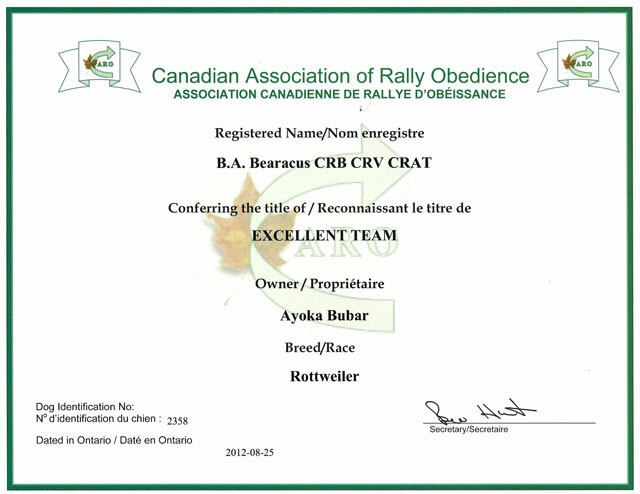 I judged at my first out-of-town Rally Trials: I had the wonderful opportunity to judge 3 times in Regina, SK. and had the opportunity to judge some wonderful dog & Handler Teams. 8. I made the switch to Raw feeding: After much consideration and a period of feeding both raw and kibble, I made the plunge. In hindsight, it’s not as big a deal as some make it out to be and I am happy I have made the switch. 9. I retrained the A frame contact for agility: I used Sylvia Trkman’s running contact method and have been thrilled with results. Since we made the switch we have missed a total on one contact in the trial setting. I love A-Frame photos, they always seem to highlight just how powerful a dog’s hind end is. 12. I accumulated 37 Continuing Education Credits towards my CCPDT recertification: In a little over a year, I have actually completed the number of hours required to recertify in December 2014. I won’t bore you with the complete listing but you can see some of the seminars I attended here. 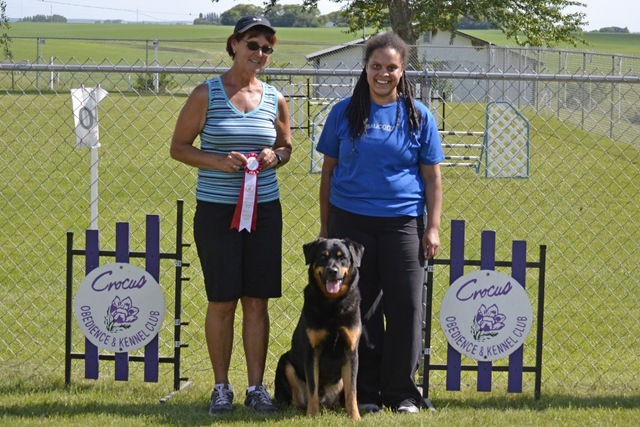 Two weekends ago, after our disastrous attempt at CKC Rally, Bear and I attended an agility trial hosted by Canine Agility Racers here in Brandon. I entered this trial weeks ago but to be honest, I was not looking forward to it at all – mostly because I was exhausted. A trip to Calgary plus the fact that Sean has been immobile due to surgery has meant a lot of work, a lot of driving, as well as, cooking, cleaning and shoveling snow for 2 when I usually have help. Did I mention I teach two classes a week and attend two with Bear (1 in person, 1 online). This leaves very little time for sleep and I felt like a zombie – a tearful, tired zombie. I did go, however, because it is a local trial (no travel expenses), Bear has been working very nicely in agility class (when we can make it), and I was hoping we would qualify in at least one snooker run and be able to finish our SGDC title. On Saturday, we started the day with a nice jumpers run, very little barking, no sniffing and only one refusal – I was very pleased. Then things went down hill with both Advanced Standard runs. So bad in fact that at one point, I just decided to call it and leave the ring. I was way too frustrated to deal with the amount of barking that was coming my way. To be honest, most of our problems were handling (my fault) weave pole related. At the end of the day was our Starters Snooker run. I decided to try the 7 point obstacle 4 times. We managed to do it 3 times and collect 34 points overall to and earning our Starters Games Dog of Canada Title! We earned the first leg of this title back in New Brunswick in 2007 so I was thrilled to finish it. 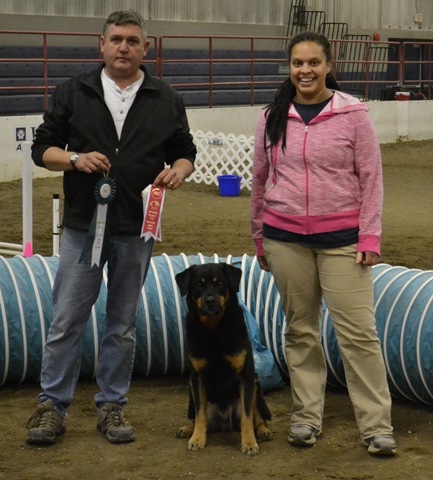 Bear and I with Judge Dave Langen after earning our Starters Games Dog of Canada Title. Photo by Tom Will. On Sunday, things went a little bit better. Our first run of the day was the Advanced Gamble. We collected enough points in the opening sequence and made it to the third obstacle in the gamble but Bear could not leave the tunnel alone. The distance was not too far – he just could not think through his insanity. The Advanced Standard run was equally bad with a lot of general stupidness around the weave poles. By the time we got to the Advanced Snooker run, I was hopeful…there were weave poles in the closing sequence but if we managed to complete the 7 point obstacle 4 times, we would have enough points to qualify – we went for it. The 7 point obstacle was the teeter which Bear loves and the 2o2o contact we have slows him down enough to keep the insanity at bay. We managed to keep it together enough to get to the teeter 4 times so I decided to try for the closing sequence but stop before we even got to the weaves to finish on a good note. This plan worked and we managed to qualify for a second time that weekend in our first Advanced Snooker run! The last run of the weekend was an Advanced Jumpers run. The first half of the course was a bit tricky…with some tight crosses and call offs but I knew if we could get past the first half that the ending would be fine, it was basically a giant jump line…Bear’s favorite! Bear was very attentive, there was a bit of grumbling at my late crosses but no barking and we finished the jumpers run cleanly earning our 3rd qualifying ribbon if the weekend. Looking back, I am actually kicking myself for not practicing the weave poles more. If we had managed to get every weave entry, we likely would have Q’d in at least 2 of the 3 Standard runs over the weekend. My winter agility project is to make our weave entries as predictable and successful as our contacts – in the last 15 runs, Bear has only missed a contact once….If we can do that, then I actually think we might be able to get to the Masters Level before Bear turns 10! A girl can always dream. 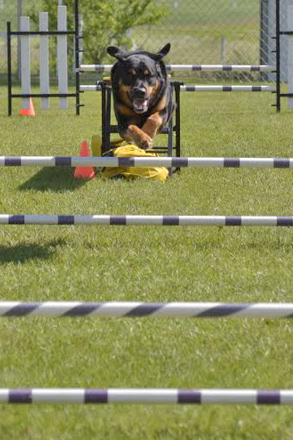 Last weekend, Bear and I were entered in our first 2 day agility trial in many years. We were entered in gamblers, snooker, standard and jumpers on Saturday and gamblers, steeplechase, standard and jumpers on Sunday. I was unsure what the weekend would be like, especially since we had missed the last two classes before the trial. 8 runs over the weekend and most runs were less than a minute long. This means less than 10 minutes of work in the ring but the 12 hour days left us both exhausted. I won’t bore you with the run by run details breakdown because I think I sum the weekend up fairly easily. Bear wondering when he can RUN again. A bit of wandering, sniffing and general drifting from Bear, especially in Gamblers on the send out. We only accomplished one weave entry out of 5 all weekend. Arriving at 7am and finishing at 7pm was a long, tiring day. Our distance work is non-existent in the gamble. I know we can do these distances in practice but after running the opening sequence Bear is a bit over the top which means lots of barking at me and not so much looking for the obstacle. No barking and lunging in/out and around the rings in a very busy trial environment. No apparent lameness – and I was stretching poking and prodding. 100% on all contacts with a couple of rear crosses, something relatively new to us. All the rear crosses in jumpers worked well for us I am glad we got to do a lot of work on them in class. I did not get any video recordings, but my friend Marne took some lovely photos during our qualifying Advanced Standard run. Do you think he likes tunnels? I think he likes tunnels. It is really clear to me that whatever 2×2 weave work we had done before is completely gone. Bear always got the weaves on the second try so it’s not the weaving but the entry that’s an issue. I am pretty sure I said I would work on weaves after the last trial and guess what, I didn’t – so I can’t really expect much improvement. Now that we are at the Advanced level in just about every class, weave entries are going to determine weather we qualify or not. Our next trial is another local one in November – I need to remember to get the 2x2s out of the garage and do some work! Last weekend we went to our first agility trial in 3 years where I remembered a bunch of things I forgot, learned some new things and generally has a nice, hot, exhausting time! We have had less than 2 months practice to get ready for the trial so I did not have incredibly high expectations. Below is a rundown of our individual runs followed by the lessons learned. Advanced Gamble – Our first run of the day started with plenty of barking (my bad handling). We completed enough obstacles to earn 24 points (we only needed 16) however I stepped over the line in the gamble because I assumed we incurred a refusal. In the end it was a non-qualifying run but I wasn’t really expecting miracles – we got the one starters gamble leg we needed in 2007 before the Starters Games title requirements changed and I think it might have been a fluke. This was a gong show. the course looked easy however the inclusion of a straight tunnel (twice!!!) meant Bear picked up a ton of speed and I could not get to my planned crosses soon enough. We earned 2 refusals and a knocked bar for our efforts – all 100% my fault. This was the event I was hoping to qualify in – we only needed one leg to complete our title. Bear completely missed the weave poles and I had to call him back – he did them properly the second time and then drifted again on a rear cross…otherwise the run was perfect until he jumped over the down contact on the A frame (3rd to last obstacle). I was relatively happy with that run since he was quiet and mostly attentive. right after we went to the pee pit and he had a #2 so clearly the sniffing was a hint that he had to go to potty and I am fortunate that he did not go on course because that makes things difficult for everyone else for the rest of the day. This courser was somewhat easier in that it was a bit slower however, I misjudged the placement of one of the jumps and Bear blew by it. Had I been paying attention, I would have seen that Bear’s jumping path after the tire would take him way out to never land, thanks to his super long stride. We recovered, finished the course and I even managed to call him off of a tunnel which is a big fat deal for a dog that LOOOVES tunnels. This was the final run of the day. Bear did NOT want to return to his crate after the jumpers run – he was tired and hot (temps were around 30 degrees Celsius). I hoped he would just be able to keep it together long enough to finish the course. The course started of with the A frame which we completed successfully and things went reasonably well until we got to the weaves. we wasted valuable seconds finishing those but managed to do it and finish off quite nicely. It wasn’t a pretty run (see it below) but we QUALIFIED! 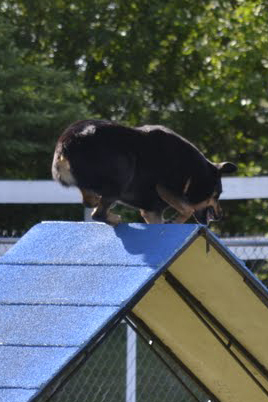 This was the 3rd and final leg required for Bear’s Agility Dog of Canada Title. Bear and I with judge Brigitte Hunter and our pretty title ribbon. I need to take Bear to potty about 2x more than I think I do! Bear works better when he’s quiet and when I am handling better. We need to work on contact obstacles at a distance – we would likely have qualified if we were both more confident in that respect. We need to work on rear crosses. By we, I mean me. In our jumpers runs I saw opportunities for rear crosses and chose front crosses instead because I am more comfortable with them but the reality is that in order to do a front cross I need to be AHEAD of Bear…fat chance! We need to work on weave poles. Messing around with weaves cost us a lot of time (20 seconds in our last run!!) and now, in advance standard we need to make the weave entry on the first time or we cannot qualify. When you say that you would be willing to volunteer as course builder – that means you get assigned to building EVERY course that day. Course building is actually not so bad, you actually work for about 15 minutes between courses and then can sit back and relax while teams are running. Course building is also a great way to learn about how courses are built, what kinds of challenges judges like to (and are allowed to include in a certain course). 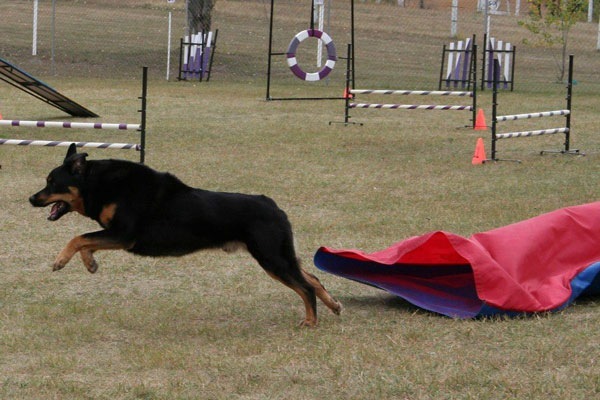 We are entered in a local agility trial this weekend – the first one since 2009! The good news is that if Bear misses the weave entry or the table, we can retry both obstacles without incurring faults and NQing, so long as we perform the obstacle correctly the second time. The weave poles have been inconsistent in class but were fine yesterday so I am wondering if the fall in weave pole performance might have been related to the iliopsoas injury. I think I might get out the 2x2s and start a refresher over the summer. The table was never an issue for us but we have only seen it once since returning to classes which means one day in – oh – 3 years. The club where we take classes seems to have limited equipment and the table can only be used in one class at a time. If it continues to be an issue, I may have to make one! The nerves of trial situations always make me flail my arms like a drowning chicken and use verbal cues I NEVER use in training. Remaining quiet, calm and graceful take every ounce of effort I have…because I am not any of those things naturally. Whatever happens, I hope to convince someone to video our runs so that I can review them and learn from mistakes (or sucess!). Speaking of video here’s one of a jumpers run in class from a few weeks ago…then I would say he would have been about 90% recovered from the injury but he’s a full-steam-ahead 100% now!